NEW SMYRNA BEACH, Fla. (February 14, 2018) – Northfield, Minn., native Cole Anderson pulled off a hat trick at New Smyrna (Fla.) Speedway on Wednesday night with his third-straight win in the Pro Late Model division. 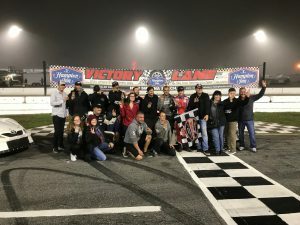 The ATF & Gunslinger team once again showed their strength at the half-mile oval, as NASCAR Camping World Truck Series champion Mike Skinner ran runner-up to his teammate. With three nights of racing remaining, Anderson continues to lead the point standings for the Pro Late Model division. Anderson started the race from the sixth position, and steadily started his charge through the field. Taking the lead by the 18th lap, Anderson fought back on several restarts as dense fog quickly settled over the speedway. With drivers unable to see the flag stand and spotters unable to see the backstretch, race officials made the decision to end the race after 25 laps. Anderson will be back behind the wheel of the No. 97 TimberwolfPlastics.com Toyota Camry for a 35-lap feature on Thursday night. For more information about Cole Anderson, visit ColeAndersonRacing.com.